By all accounts retailers had a banner Black Friday. Lines were long and formed early, doorbusters were big draws and shelves were cleared out at retailers like Target, Walmart and Best Buy. Toys R Us prepared for the biggest Black Friday in its history, Greg Ahern, senior vice president of marketing and ecommerce told WalletPop, and early reports suggest it wasn't disappointed. Stores opened earlier than ever, at 10 p.m. Thanksgiving night compared to midnight the year before.Many Best Buy stores were picked clean of popular items like new gaming systems and notebook computers. Walmart's doorbusters went fast (too fast for this reporter, who missed out on the one deal of interest), and crowds at one Target store got nasty. According to the National Retail Federation, 212 million shoppers visited stores and websites over Black Friday weekend, up from 195 million last year. 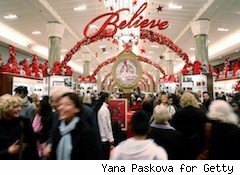 People also spent more, with the average shopper this weekend spending $365.34, up from last year's $343.31. Total spending reached an estimated $45.0 billion. Sears was open Thanksgiving morning, from 7 a.m. until noon, letting those who weren't home basting a turkey shop and work for a brief period. On Black Friday, Sears spokesman Tom Aiello told WalletPop that layaway is increasingly popular with shoppers, especially those buying larger ticket items. "When putting an elliptical machine, TV or an appliance on layaway, we're seeing some (customers) will keep it on layaway through 2011, and have then have it paid off in time for a New Year's resolution or Super Bowl Sunday," Aiello said. But these are items intended for personal use, not as gifts to be opened on Christmas morning, raising the question of whether consumers are shopping for themselves or others during the early season sales. Sue Sung, head of the consumer retail practice at Stax Consulting, admits to shopping early deals for herself and waiting to buy gifts for others until later in the season. Regardless of the recipient or motivation, paying full price is a no-no on most goods. "Consumers should absolutely not pay full price," she said in a phone interview. "Retailers are going to be promotionally-driven and as a consumer, you're a fool if you pay full price, and a fool if you shop a single (retail) channel. You have the internet at your fingertips and don't assume stores are unwilling to discount, even on the hot items." And stores are likely to continue with special Black Friday promotions from now until the holiday, or start slashing prices on goods the closer we get to Christmas. Said Sung: Consumers should not freak out if they didn't shop on Black Friday. There will be more deals to come.